Paneling is like the frosting on the cake to any room. 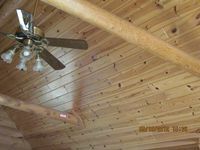 Red Knotty Pine paneling is a beautiful touch, with the grain and natural look, it makes any room stand out. 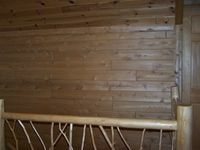 We also carry White Knotty Pine and Northern White Cedar Paneling. Most of these come in random lengths to break up the lines when installed. However, you can get it cut to most any length you desire. The width is 4" to 8" depending on your taste. 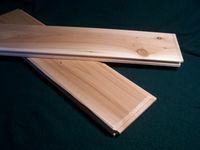 All paneling is tongue and grove, however, there are additional options, like T&G end match or blunt ends, and, random lengths. Random length allows for an eye pleasing staggered pattern (board ends don't line up). Our show room walls have large layouts of cedar, white pine and knotty pine paneling which aid your choice by giving you the big picture.